Dickinson is a city in Stark County, North Dakota, United States. You'll discover tucked-away gems like North Unit and Bully Pulpit Golf Course. Museum-lovers will appreciate North Dakota Cowboy Hall of Fame and Harold Schafer Heritage Center. 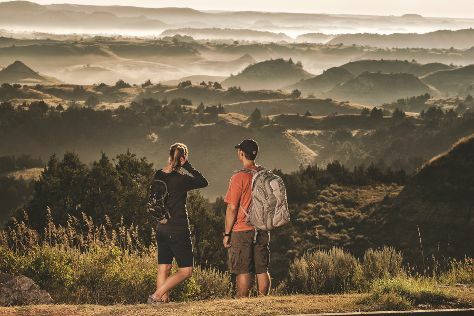 Get out of town with these interesting Dickinson side-trips: Theodore Roosevelt National Park (South Unit, Painted Canyon Overlook, & more), Pioneer Trails Regional Museum (in Bowman), Enchanted Highway (in Regent) and Medora (Oxbow Overlook, Theodore Roosevelt National Park, & more). Next up on the itinerary: see the interesting displays at Ukrainian Cultural Institute. For ratings, more things to do, traveler tips, and more tourist information, read Dickinson itinerary planner. Use the Route module to find suitable travel options from Brooklyn to Dickinson. Traveling from Brooklyn to Dickinson, you'll gain 2 hours due to the time zone difference. Plan for slightly colder nights when traveling from Brooklyn in August since evenings lows in Dickinson dip to 54°F. Finish up your sightseeing early on the 21st (Sun) so you can travel back home.